Chapter 6 of REG is all about contracts – formation, performance, discharge, breach, and remedies. For today’s lesson we will be discussing the formation of a contract. Here are today’s learning outcomes. Summarize the elements of contract formation between parties. Identify whether a valid contract was formed given a specific scenario. Identify different types of contracts (written, verbal, unilateral, express, implied, etc.) given a specific scenario. Contracts are agreements between parties that are enforceable in court. They can be agreements to buy/sell, perform a service, or to refrain from doing something. To begin, there are two general forms of contracts: Unilateral contracts and Bilateral contracts. Unilateral Contracts – Only one party has a legal obligation to uphold the terms of the contract. If you put an advertisement in the newspaper with a $100 reward for your lost pet and someone returns your lost pet then you have a legal obligation to pay that person. Nobody has a legal obligation to find your pet. Bilateral Contracts – More common than a unilateral contract. Both parties have a legal obligation to uphold the terms of the contract. Company “X” promises to pay Company “Y” $10,000 in exchange for computer equipment. Company “Y” must provide the equipment and company “X” must pay the $10,000. As it relates to substance, the unilateral contracts or bilateral contract can be either a written contract or an oral contract. Oral Contract – Oral agreement between two or more parties. 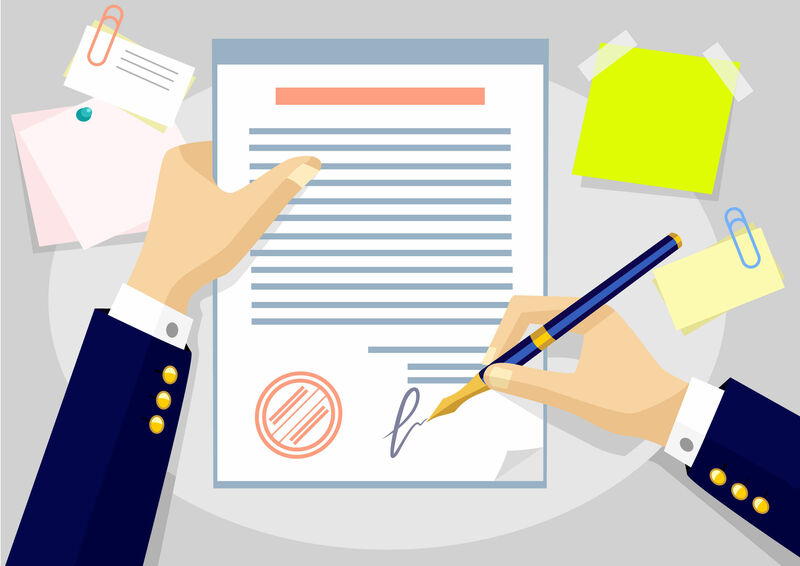 Written Contract – Written agreement between two or more parties. A contract can be either an express contract or an implied contract. Implied Contract – Even though a written or an oral agreement doesn’t exist, you can imply that a contract exists based on the actions of both parties. A contract can still exist even when one party doesn’t actively agree to the terms of the contract. The courts will uphold implied contracts so that one party won’t be unfairly enriched. Bob get’s into a car accident and is rushed to the hospital. A surgery is needed to save Bob’s life and Bob is not conscious to agree to the “contract.” The hospital saves Bob’s life and sends him a bill. Bob is liable for the bill even though he didn’t agree to the contract. Express Contract – Both parties come together and agree to the terms of the contract. Company “X” wants to hire Company “Y” for outsourced accounting services. Both parties sit down and write a contract that expressly states the duties or each party. A contract can be either valid, void, or voidable. Valid – Can be upheld in court. Void – Won’t be upheld in court. Voidable – Can be voided by one party. Usually this happens when there is a material mistake, misstatement, or fraud from one of the parties. The other party may choose to void the contract or affirm the contract. In order for a contract to exist you need to meet certain elements. So before you can identify the type of contract you must first determine if a contract actually exist. Offer – One party offers something to another party. You can have a counteroffer but this is still considered a valid offer. Acceptance – One party accepts the other parties offer. The party giving the initial offer can be the party to accept if the other party gives a counteroffer. Present consideration – Both parties need to give something of value as it relates to the proposed contract. You can’t have a contract if one party isn’t giving anything up. Additionally, prior consideration (I gave you a really nice Christmas gift last year so you should give me your car) isn’t a valid form of consideration. Legal – The contract needs to be legal. You can’t enter a contract to have someone slash your ex boyfriends tires and think that’s going to hold up in court. Know the elements of a valid contract. Know the different types of contracts. Understand when a contract is valid, void or voidable.